The Power Center is a full-service catering facility that handles most aspects of reception planning from inception to execution. Even though our professional sales staff can create a completely customized menu for your event, we have created three Wedding packages with numerous options to assist you in your planning. Working with you, our clients, we can assist in selecting the details that will make your wedding day personal and unforgettable. Our inclusive packages are designed to take the stress out of planning, yet still allow you numerous options to make the day your own. 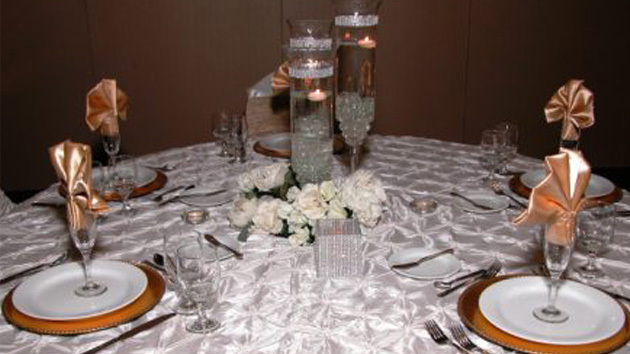 Get a grip on the approximate number of guests you’ll invite before settling on a venue. This will ensure there’s ample space for your crew. As a rule of thumb, allow for 25 to 30 square feet per guest. That may seem like a lot, but it’s not if you count the space you’ll need for the tables, bustling waiters, the band, and the dance floor. Know ahead of time if your wedding date falls on the same day as a trade conference, charity walk, or other local event that could affect traffic and hotel room availability. In a three-ring binder, compile all your correspondences with vendors, notes you make during meetings, and photos or tear sheets from magazines you want vendors to see. Set up a special email address dedicated to your wedding, and store important vendor numbers in your cell phone.